I am 6ft 5inches tall,about 15.5 stone in weight. 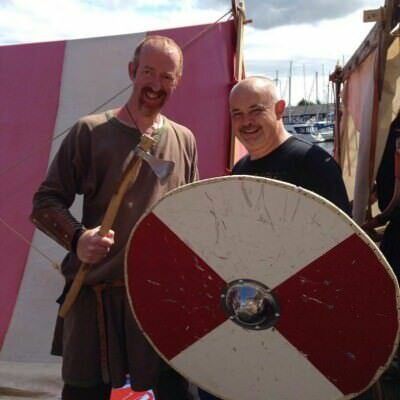 I practice outdoor rituals with a group.I have an allotment & am in a viking reenactment group doing shows all over the country,have been on a couple of tv programmes' I have very wide interests & love making things. I split with my wife 18 months ago & am looking for someone to share love with. I work as a warden in sheltered accommodation & do all the gardening.like most music.Love cooking.Love the outdoors & herb lore. Varies,I always think your moods change (happy,sad,relaxed,bad days) so your music will change to suit your mood. cooking,making stuff (viking kit,bits for pagan rituals,bits people ask me to make for them) being outdoors,reading,cuddling up & watching a movie,camping,snorkelling,my allotment & loads more than i can type,I like to live life. someone with a love for the outdoors & for doing stuff. Don't get me wrong,I enjoy watching tv but love being active. Meet at a mutually agreed venue(no point taking the lady to a restaurant if she wants to go drag racing) & get to know each others interests & what we have done in our lives up to now.